The pink noodle soup yen ta fo (yen ta fo) is a popular bowl among locals and you find it all over Bangkok. It gets it color from fermented been curd and not ketchup and tomatoes as some think. At best it’s a fantastic dish, but most vendors serves a rather mediocre bowl or worse, with far to much sweetness. Yen Ta Fo What Khaek avoids the trap and serves a good bowl with distinct tartness. 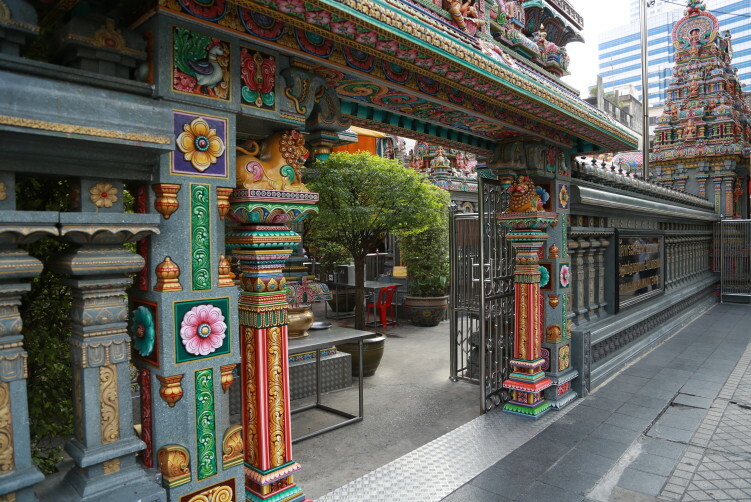 The shophouse got it’s name from the Hindu temple Wat Khaek (Sri Maha Mariamman Temple) a few meters away. A nice thing to notice here is the old style interior with wooden tables and chairs, contrary to metal and plastic in most newer spots. That’s normally a good hint for tasty and authentic food. And Yen Ta Fo Wat Khaek have already been 50 years in business, so that should speak for quality. A bowl of yen ta of here comes with fish balls (look chin pla), fried tofu, crunchy morning glory (pak boong), rice noodles as you like them, congealed chicken blood and a piece of squid. 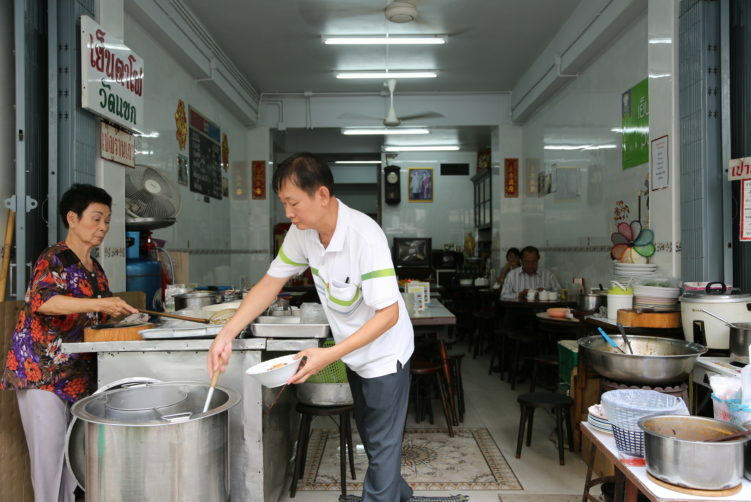 If you like it as a soup, they use chicken broth, but you can also order it dry (haeng). I know it doesn’t sound like the most appealing thing to order for a westerner, but take my words for it, a well made yen ta fo is a delight. And here they serve a good version, tart and with a slight sweetness. But I miss the punch of garlic which really lift this dish into something special. When not, it gets a little blend. Anyway, don’t get me wrong, it’s a good bowl and far above 95 % of the vendors in town. Not to forget that their noodles are really good. 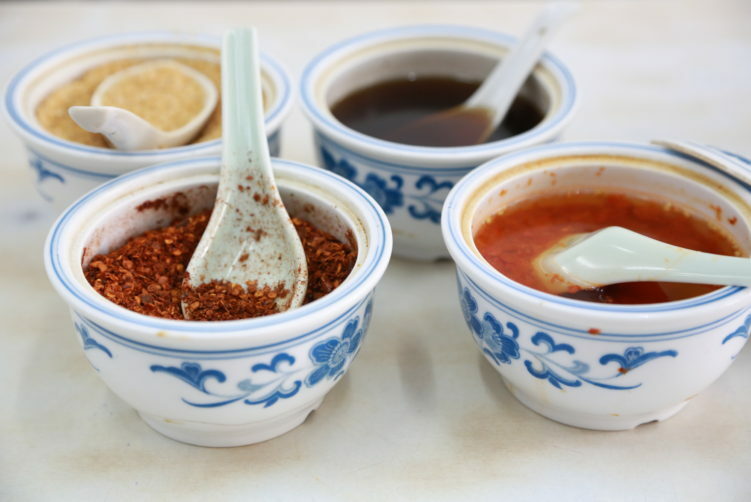 You find different condiments on the table to adjust the taste to your likings. Most Thai’s would probably add sugar as the version here is a bit tart. But that’s a good way of doing it, instead of making it overly sweet and then try to adjust it. Yen ta fo is originally a Hakka dish, but it has changed quite some bit after arriving in Thailand and south East Asia. The traditional Hakka version includes tofu stuffed and heaped with minced lamb or pork meat and herbs before being fried until golden. Various condiments or add-ons varies, but vegetables, shiitake mushrooms, eggplants and bitter melon are common. Fish balls, morning glory, blood, squid and fried tofu is the most common add-ons in Thailand. Chicken stock is most common when serving it as a soup. The red fermented bean curd has a distant similarity in taste with Sri Racha sauce, but is definitively not the same. They also serve other good dishes, like stewed pork leg with rice (khao ha moo), fermented rice noodles with chicken curry (khanom jeen kaeng kai), Islamic salad and Thai fresh spring rolls. I also ate the chicken curry which was good. It was supplemented with eggplants, basil leaves and fresh chilies. If you are on the hunt for other good eating options in the area, check out my other reviews in the Silom area. If you like to zoom out, use my Bangkok Food Map. cheap generic viagra Food: Yen ta fo and a few other Chinese inspired dishes. https://sheisfiercehq.com/shop/ order now Address: 8 Pan road, just off Silom road. How to get there: Take the BTS to Chong Nonsi station or hit the road if you are in the Silom area. It’s 10-15 minutes walk from Silom station where the Sukhumvit- and Silom BTS-lines meet each other. With BTS, take exit #3, then take left into Silom Road. You find Soi Pan 4 minutes down the road. Yen Ta Fo What Khaek serves a good bowl of Yen Ta of with distinct tartness. They also have other dishes like stewed pork leg with rice (khao ha moo), fermented rice noodles with chicken curry (khanom jeen kaeng kai), Islamic salad and Thai fresh spring rolls for those not enjoying anything that has to do with fish. See full review at StreetsideBangkok.